Shepard's saves you time and costly errors by helping you quickly validate Shepard's saves you time and costly errors by helping you quickly validate your research to build your arguments efficiently and reliably and ensure you have good law. For pricing or to place an order, please contact us at 1-877-394-8826. 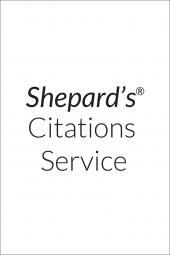 • Be sure your case or statute is still good law by using Shepard's time-tested, reliable legal analysis to check the current status of your authority. • Find additional supporting authority, including citations from decisions of New York courts, the U.S. Supreme Court and lower federal courts. • Your all-inclusive subscription includes regular cumulative supplementation, plus any hardbound publications issued, for one year.